Antipathes sp. Bushy Black Coral. Finely branched to the point of bushiness. Colored gold to brownish. Circumtropical genus. N. Sulawesi pix. Antipathes dichotoma. Black Coral. 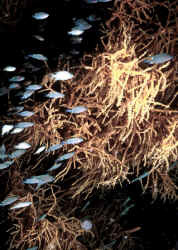 The largest black coral tree species in the Red Sea. Used for its hard proteinaceous endoskeleton in the jewelry trade. Close up by Diana Fenner. Antipathes galapagensis (poss.). In a swim through cave in Puerto Vallarta 2015. Antipathes gracilis Orange Sea Fan Black Coral. 1.5-4'. 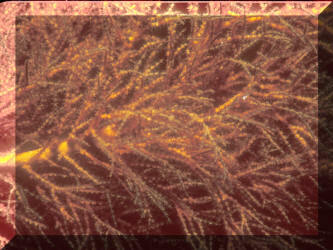 Uniplanar colonies that are stiff and primary and secondary branching. Roatan 2017. Cirrhipathes anguina, Whip Coral, Red Sea. Often twisted on its singular axis. Red Sea pix by Diana Fenner. 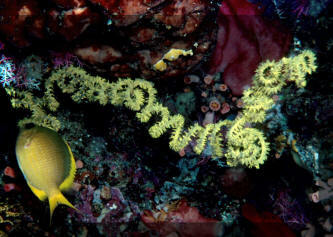 Cirrhipathes (Stichopathes) leutkeni, Wire Coral. Tropical West Atlantic. Up to fourteen feet in length. Cozumel image. Cirrhipathes sp. Nuka Hiva, Marquesas, Polynesia. Plumapathes pennacea. Black Coral. Darker brown branches with lighter brown side branches in a single plane. A nice stand in Cozumel 2014.